System Driven Innovation enables you and everyone on your team to use innovation to work smarter, faster, and more creatively. It transforms innovation from a random act to a reliable science. This new mindset ignites confidence in the future. It enables the creation of bigger and bolder ideas--and turns them into reality faster, smarter, and more successfully. With this new mindset, innovation by everyone, everywhere, every day becomes the norm. The rapidly changing world becomes a tremendous opportunity to achieve greatness. If you're Meaningfully Unique life is great If you're NOT Meaningfully Unique you'd better be cheap. What makes Innovation Engineering unique is that it's grounded in data, backed by academic theory, and validated in real-world practice. Collectively, it's the number one documented innovation system on earth. Over 35,000 people have been educated in Innovation Engineering classes, and more than $15 billion in innovations are in active development. 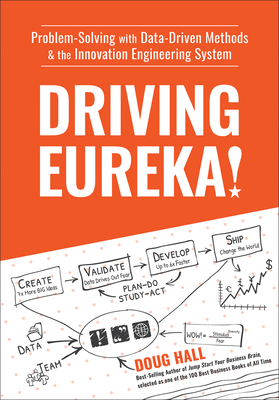 In his book Driving Eureka , best-selling business author Doug Hall presents the System Driven Innovation scientific method for enabling innovation by everyone, everywhere, every day. It's the essential resource you need to enable yourself--and your team--to innovate, succeed, and do amazing things that matter, on a daily basis. Doug Hall is an inventor, author, and whiskey maker. He's a chemical engineer who rose to the rank of Master Marketing Inventor at Procter & Gamble. At P&G, using the principles that would become Innovation Engineering, his team invented and shipped a record 9 innovations in just 12 months. He has been named one of America's top innovation experts by A&E Top 10, Inc. magazine, The Wall Street Journal, Dateline NBC, CNBC, CIO magazine, and the CBC. In 1986 he founded the Eureka! Ranch, focused on a singular mission to find, filter, and fast-track big ideas. Today, the mission is the same; however, through the application of Innovation Engineering system-thinking to innovation, Eureka! Inventing projects (by the Ranch team and Planet Eureka! Network partners) invent 10 times more "big ideas" and make them real up to 6 times faster than existing innovation systems. In 2009 he founded the Innovation Engineering Institute, focused on changing the world through systems that enable innovation by everyone, everywhere, every day. It's a new field of academic study and leadership science that is taught as an undergraduate minor and graduate certificate on college campuses and off campus through Innovation Engineering Blue Belt and Black Belt courses, coaching, and certifications. In 2016 he founded Brain Brew Custom Whisk(e)y on the belief that the world doesn't need another whiskey, but everyone needs their own whiskey. The Brain Brew team is powered by the Eureka! Ranch culture and the Innovation Engineering systems. They collaborate with craft whiskey companies to accelerate the development of luxury smoothness through application of Brain Brew's time-compression technology. Doug is the best-selling author of seven books. He has starred in two network television series (ABC's American Inventor and Backyard Inventors) and a nationally syndicated radio program (Brain Brew Radio). Doug authored and performed a one-man play, North Pole Tenderfoot, on his adventure re-creating Admiral Peary's last dash to the North Pole. For his pioneering work on system-driven innovation he was awarded an honorary doctorate in engineering from the University of Maine and a doctor of laws from the University of Prince Edward Island. Doug is a citizen of Canada and the USA. He is married to his high school sweetheart, and they have three children. They divide their time between Cincinnati, Ohio, USA, and Springbrook, Prince Edward Island, Canada. He is passionate about sailing, craft pizza, craft whisk(e)y, cross-country skiing, and bagpiping.